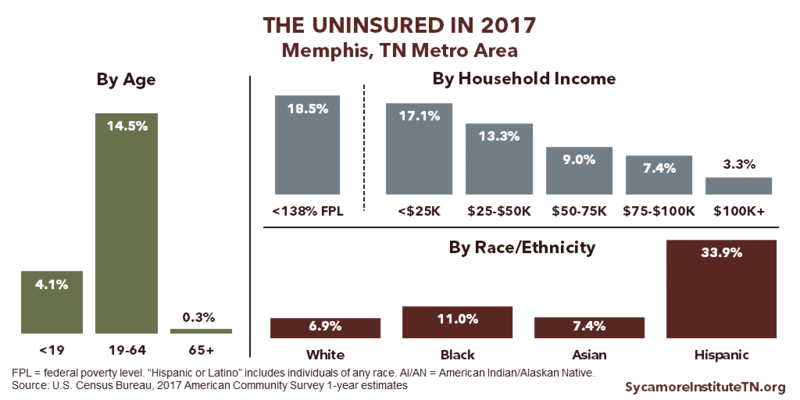 The U.S. Census Bureau released new data this month on health insurance coverage across the U.S. in 2017. Here are our top 3 takeaways for Tennessee. See the Metro Area Charts section at the end for Tennessee metro area data. 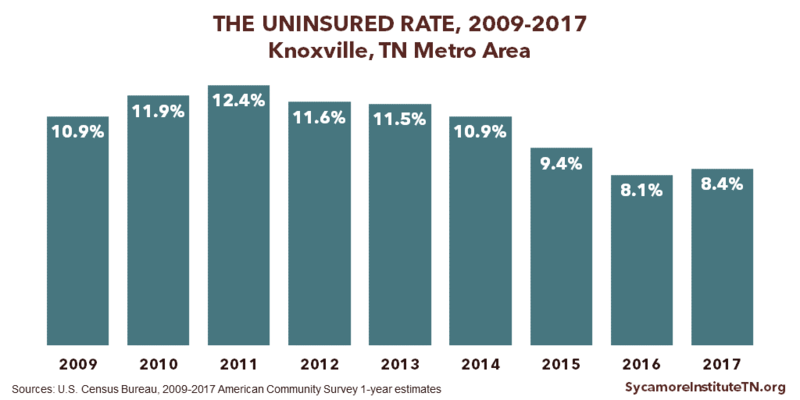 In 2017, 629,142 Tennesseans were uninsured, about 37,000 more individuals than in 2016. 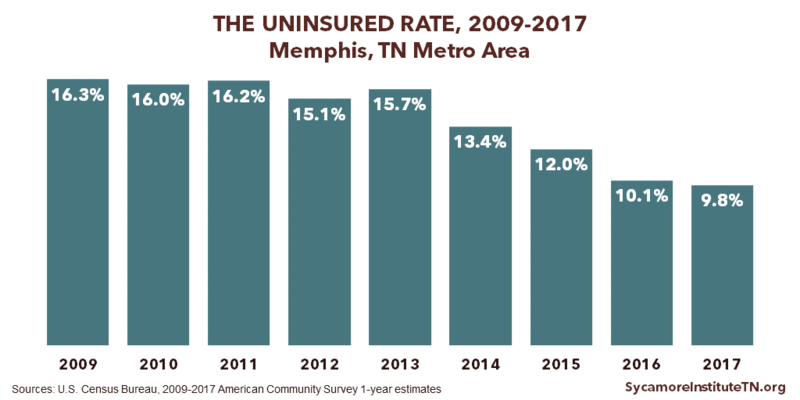 The uninsured rate in Tennessee increased from 9.0% in 2016 to 9.5% in 2017. 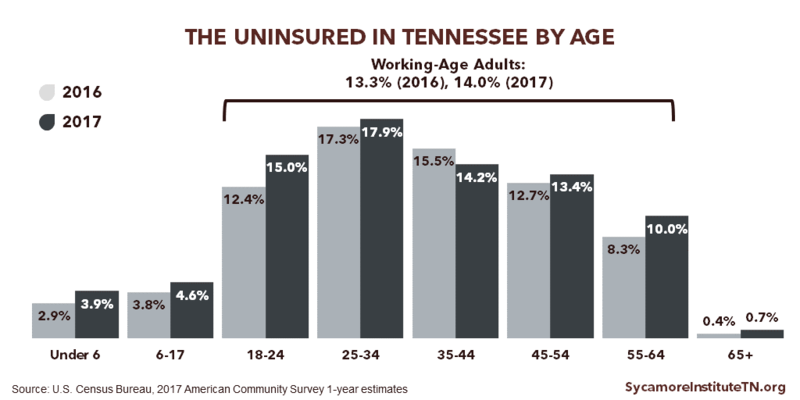 The largest increased in the uninsured rate occurred among 18-24 year olds, Tennesseans with incomes between $50,000 and $75,000, and individuals with less than a high school diploma. 1. 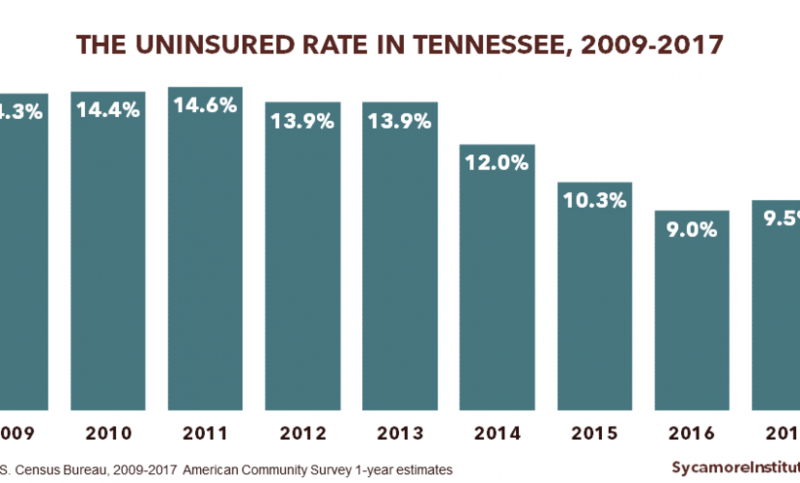 Tennessee’s uninsured rate increased in 2017. Nationally, the uninsured rate increased from 8.6% to 8.7%. 2. Uninsured rates varied significantly by age and race/ethnicity. The uninsured rate increased for all age groups except 35-44 year olds. The largest increase was among 18-24 year olds from 12.4% in 2016 to 15.0% in 2017. 3. 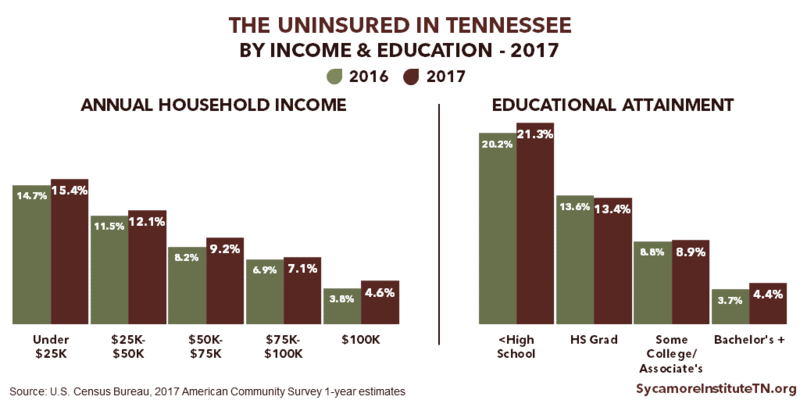 Uninsured rates were higher for Tennesseans with lower incomes and less education. 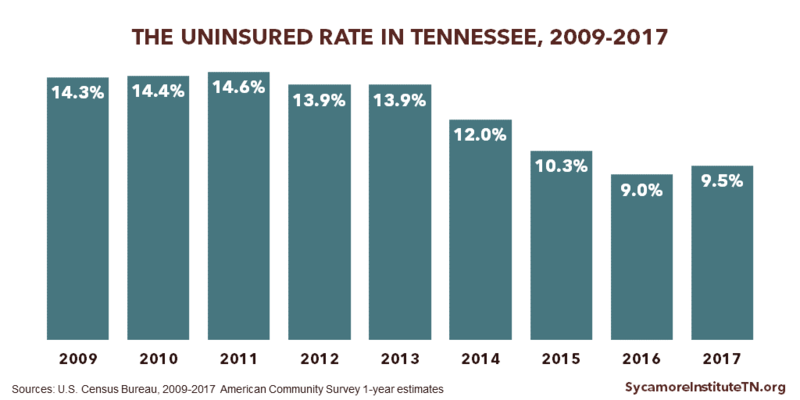 Uninsured rates were higher for Tennesseans with lower incomes. 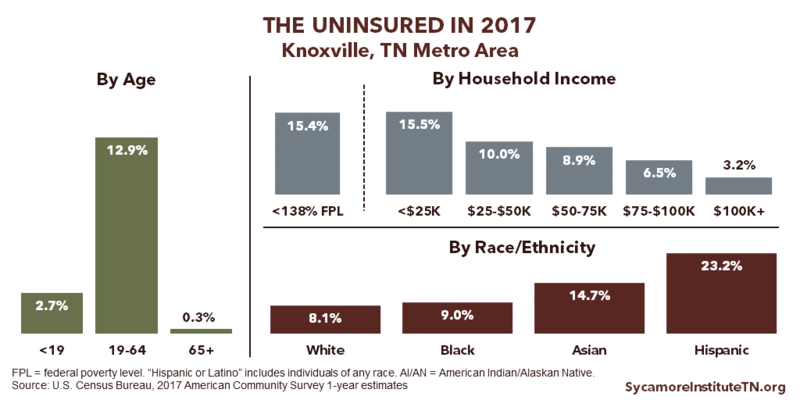 4% of Tennesseans living in households with incomes below $25,000 were uninsured compared to 4.6% living in households with incomes above $100,000 (Figure 4). 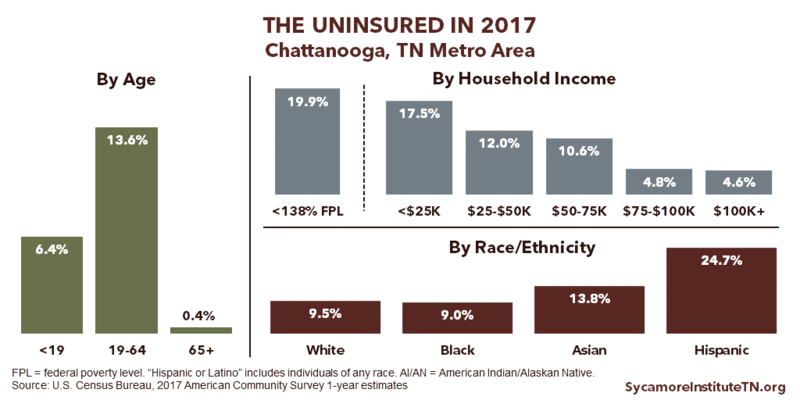 17.0% of Tennesseans with incomes below 138% of the poverty threshold were uninsured compared. 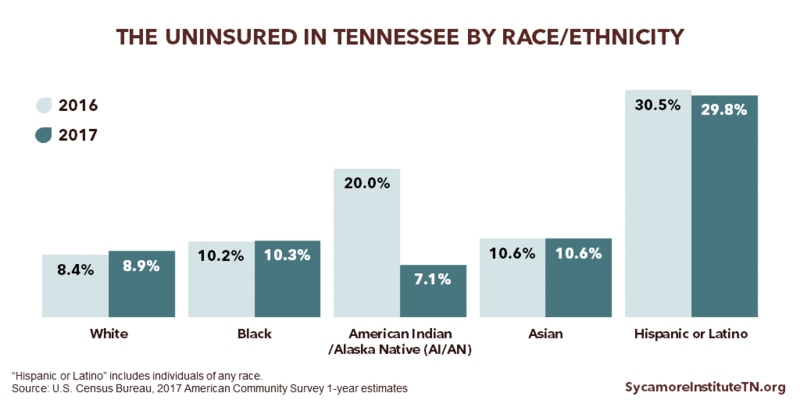 Uninsured rates were higher for Tennesseans with lower levels of education. 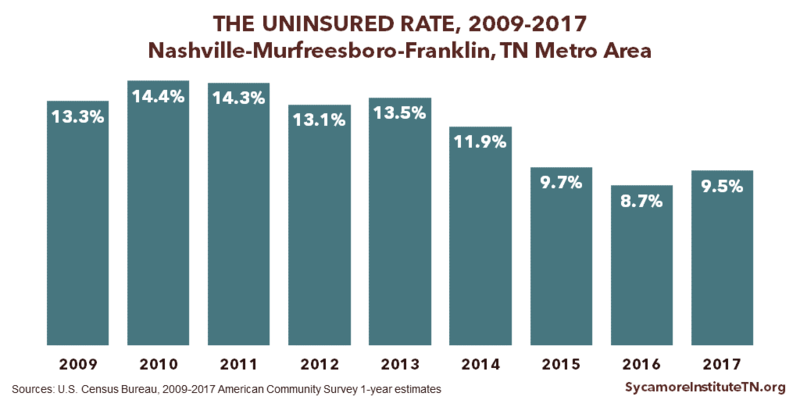 21.3% of Tennesseans with less than a high school education were uninsured compared to 4.4% with a bachelor’s degree or higher (Figure 4). 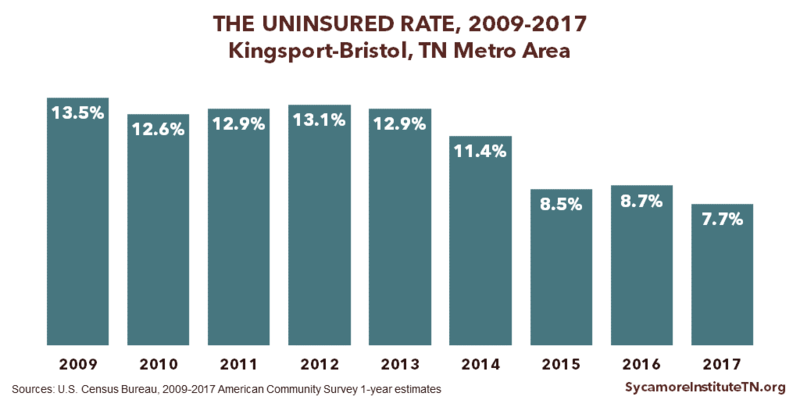 The uninsured rate increased the most for Tennesseans with incomes between $50,000 and $75,000 — from 8.2% in 2016 to 9.2% in 2017 — and for individuals with less than a high school diploma — from 20.2% in 2016 to 21.3% in 2017. The U.S. Census Bureau’s September data release also includes 2017 estimates for 5 metropolitan statistical areas (MSAs) that include Tennessee cities. MSAs include population centers and their surrounding areas — including areas that can cross state lines. (2) Later in the year, the Census will release county-level estimates using 5 years of data (2013-2017). The Chattanooga, TN metropolitan statistical area (MSA) includes Chattanooga and its surrounding areas — including areas in Georgia. A map of Tennessee’s MSAs can be viewed here. 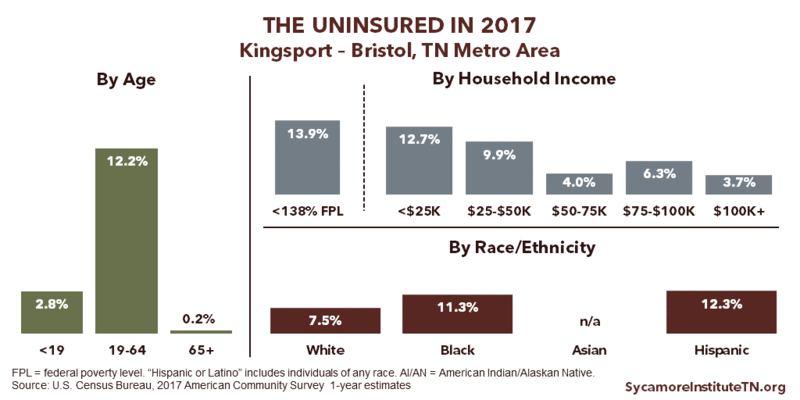 The Kingsport-Bristol, TN metropolitan statistical area (MSA) includes Kingsport, TN, Bristol, TN, Bristol, VA and their surrounding areas — including areas in Virginia. A map of Tennessee’s MSAs can be viewed here. The Knoxville, TN metropolitan statistical area (MSA) includes Knoxville and its surrounding areas. A map of Tennessee’s MSAs can be viewed here. The Memphis, TN metropolitan statistical area (MSA) includes Memphis and its surrounding areas — including areas in both Mississippi and Arkansas. A map of Tennessee’s MSAs can be viewed here. 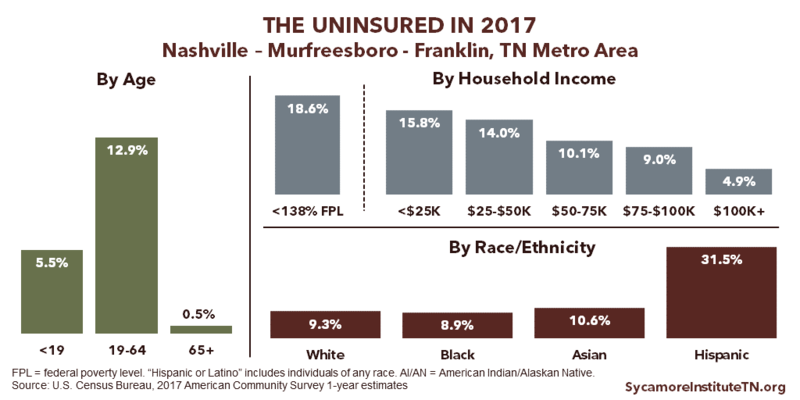 The Nashville-Murfreesboro-Franklin, TN metropolitan statistical area (MSA) includes Nashville, TN, Murfreesboro, TN, and Franklin, TN and their surrounding areas. A map of Tennessee’s MSAs can be viewed here. Download the PDF file for a full data table. 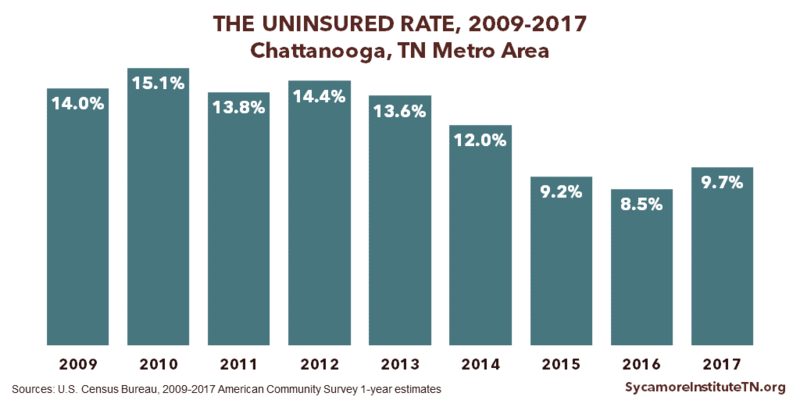 (October 5, 2017) Analyzes 2016 data on the rate of the uninsured and where insured Tennessean’s get health coverage. (January 30, 2018) Provides 2016 county-level data on uninsured rates by employment and income. U.S. Census Bureau. American Community Survey 1-year estimates. Table S2701. [Online] 2009-2017. [Accessed on September 13, 2018.] Accessed via factfinder.census.gov. —. Geographic Terms and Concepts – Core Based Statistical Areas and Related Statistical Areas. [Online] https://www.census.gov/geo/reference/gtc/gtc_cbsa.html#mesa.